An incalculable, unbelievable loss. The one good thing I can think of was it happened on Monday evening and not during a Holy Week service. Je vous salue, Notre-Dame de Paris. True indeed! I worry that there may yet be casualties among whoever was helping renovate/who now is helping fight the fire. For those who haven't heard yet, word from Paris is no fatalities at all. There's some small mercy. No words can express the depth of my sadness and horror. Um. Thank you for the link. I spent most of the day participating in the collective horror on Twitter, unable to pull myself away. 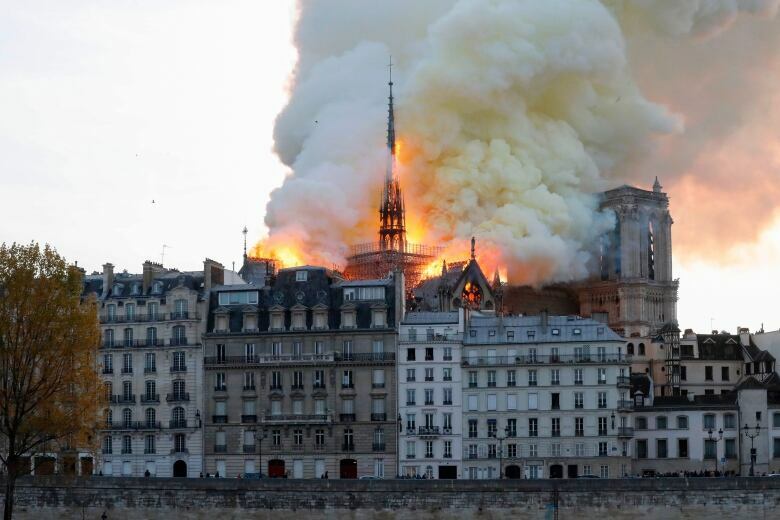 I'm glad they were able to at least save the structure and the bell towers, and that at last report, no one died in the fire, although one firefighter was badly injured. When the fire first broke out, I wondered if there were tourists up in the bell tower -- evacuating the bell tower while a fire raged next to it is the stuff of actual nightmares. Fortunately, the fire started after the Cathedral had closed to tours for the day. I'm also glad that some of the artwork and historical artifacts were saved. Latest word is only some of the stained glass windows were destroyed by the heat. The vault has a few small holes in it, but most of the structure is intact, for now. Things could have been much, much worse. OTOH, I wouldn't trust the structural integrity of any part of the vault any more at this point, not after the stones got cooked like that. Job one is going to be to reinforce the vault from below while they rebuild and reinforce it. Job two will be assessing the remaining stained glass and the sculptures, etc, to determine which got cooked badly enough to need repair and which just need to be cleaned. Oh, and build a new roof, of course. Somehow I suspect this time they'll use steel girders instead of wood to hold up the roof. The artworks in the cathedral have all been photographed and studied so extensively that I don't doubt they can produce pretty darn near exact replicas of everything lost. But it's going to take at least a decade, probably longer, and if it costs less than a billion euros I would be extremely surprised. Quasimodo was up in those bell towers with multiple fire extinguishers. Seriously, horrible, but I am glad it wasn't much much worse. I didn't know James was in Paris. Almost exactly a year ago to the day, I was in Paris standing outside Notre Dame. Only a flying visit, didn't go inside. An impressive building.